It sure seems to have taken all these manufactures their time but in the last few days everyone is seeing the light of using you smartphone as a remote viewfinder and/or control for you camera. 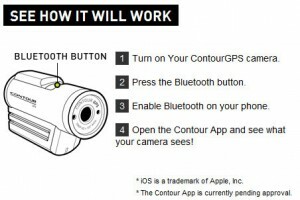 Contour who produce helmet type video cameras which compete against the Drift camera recently reviewed by us – have announced an app for Android and iOs (iPhone and iPad) to connect you phone remotely via bluetooth to the ContourGPS camera and have it act as a display. Still in development but it looks rather interesting.